Holy Cow, this only confirms my suspicions of her. Can you send me the url where she says that? I don't recall in which one of her essays I read it...but if I come across it, I will forward it. I do believe that now. I have all of the Seth books that Jane Roberts channeled, read them in the 80's and 90's. Then I read a lot of Ramtha books, and he turned out to be a counterfiet personally created by Johova, another being of darkness. Actually she names quite a few people as does Don Croft and cbsworks. The whole NEW AGE movement is Annunaki created, billion dollar industry! She writes that the bible is the history of the annunaki and not a holy book for humanity. What are you suspicions of her? Well, I guess we don't agree, but I'm glad to hear your opinion. I don't equate Ramtha and Seth. The character of JZ Knight, the context of her communications with Ramtha, her manipulation of people to squeeze them of their money, and Ramtha's words all betray a dark agenda in my opinion. Jane Roberts and Seth are a totally different story. With Seth, I read enlightenment, I read wisdom and I see no attempt to manipulate. If you read Dr. John Coleman's books, it's clear that the New Age movement was created by the Illuminati to deceive. You have to conclude that it began with Blavatsky, Alice Bailey, Annie Besant, etc. However, you can't conclude that every person who has ascribed to ideas of spiritual enlightenment in this era , usually lumped into the New Age category, are being duped or are unwitting minions of the Annunaki. That's ridiculous. Ancient Vedic literature is one place where you find references to the 26,000 year long Yuga cycles that the Earth and its inhabitants pass through. The Yugas are first divided into four quarter cycles and then subdivided into subsections of each quarter cycle. Each cycle and each sub cycles are allotted a certain number of years, with the total adding up to roughly 26, 000. When the Earth passes through that portion of the cycle where the Earth is physically located closest to a point in the universe that's characterized as "the seat of God", we experience greater enlightenment and an expansion of conscious awareness. 13,000 years later, when the Earth is located at a point most distant from the "seat of God" center in the universe, we experience cultural regression, primitive conditions, and a retardation in conscious awareness. That's what the Veda teaches. Whether you are open or not to that teaching is up to you, but that's what it says. Currently, we are entering a sub cycle of the Yuga that is bringing the Earth closer to the "seat of God" and we are experiencing a growth of spiritual awareness and expanded consciousness. Astrologically, the Age of Pisces ran for 2,000 years and we are now in the Age of Aquarius. So our expansion of awareness is only going to continue to increase by virtue of being alive on the planet at this time, regardless of what the Illuminati may want. It's obvious that the Illuminati (and their alien pals) knew that this era of expanded consciousness was coming and they wanted to contain and manipulate it by setting up the New Age movement, but that's Standard Operating Procedure for them. However, they don't OWN the New Age, if that's what we're going to call this time of expanded awareness. The best that the Great White Brotherhood can hope to achieve is to manipulate it to their own advantage by setting up front organizations that claim to be the "leaders" of the New Age movement. So we wind up with people like JZ Knight, or Clare Prophet, or I Am, who behave in such a way that it's fairly easy to see through them,. however, there are other people who may appear to be on the path of truth and enlightenment, but they may be marionettes of deception themselves. For a number of years, I've had concerns about Sai Baba, despite the fact that many people view him as a holy man. A few weeks ago, I asked ZS Livingstone WHERE does Amitakh Stanford get her information from? He told me that she mentions her association with Sai Baba somewhere in her writings. 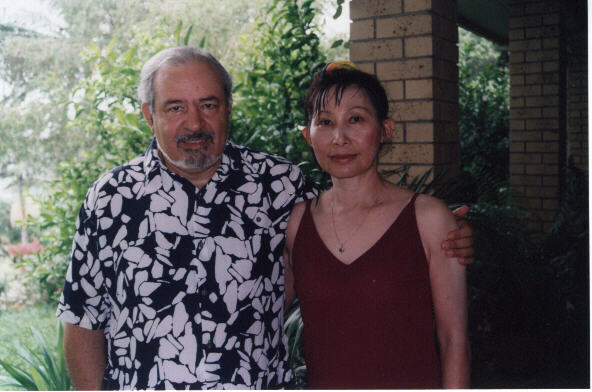 I have already expressed my concerns about Amitakh Stanford in introductory remarks (1) appended to a couple of her essays posted at my site (2) Fabian Wong sent me an e-mail a few months ago that indicated that Amitakh was the former wife of Dr Joseph Chiappalone. It seems that Dr. Chiappalone may have died a couple of years ago or they got divorced (Update Feb. 25, 2007: I received an e-mail from a person in Australia who said that Dr Chiappalone is working at a medical practice in Stanthorpe, Qld Australia) and that Amitakh remarried Steffan Stanford which one web site identified as a "Barrister at Law Queensland, Tasmania, Attorney at Law Washington State" . Assuming that she was indeed the former Mrs Chiappalone, then I have to say "bingo!" again. I used to become very irritated whenever I read something from Dr. Chiappalone posted at Jeff Rense's web site in the late 90's and up to 2001 or 2002. He always titled his essays " The Terminal Madness of the End Times " Part 1, 2, etc. Talk about a Doom & Gloomer! Oh My God, this guy was off the chart! What nonsense! What rubbish! I got so angry at the time that I fired off a very sharp e-mail to Jeff Rense (whom I was e-mailing often) and asked him WHY he was interviewing this guy so often and posting his "In-terminal" Doomsday crap! I was surprised when Jeff responded back with "You may be right!" So even Jeff Rense was beginning to have his doubts about The End Times Terminal Madness guru. [From Ken Adachi, July 15, 2006:: I'm getting some very thoughtful feedback on the above article which is far from complete. I'll be adding more to my article as time allows. It's not really my intention to debunk Amitakh because I find her information both interesting and somewhat corroborative of insights gleaned from other sources, however, she makes some astounding statements that need to be questioned and scrutinized. Her 'work', if we should call it that, has the additional effect of leaving the reader with certain feelings or subliminal 'conclusions' that I'm not altogether comfortable with. I think this is a photo of Amitakh Chiappalone before she was Amitakh Stanford. What do you get from looking at their photos. Is that fear I see in her former husband's eyes, and from whence does it come? "Peeping from behind the stage changes the whole story. Wrecks the whole plot even." - my quote. I just did a little searching on the net and found this 2004 article posted at Rumor Mill News by a person using the pen name of "Channelz." It's so well done and so fully encompassing, that I don't have to write any more here about my suspicions of Amitakh. This anonymous author, "Channelz" has done the job for me. From: petak, October 13, 2006. Man oh man, folks we need to be more discerning. How can anyone believe, even as bad as things can get, that the whole physical universe is a purely evil creation allegedly overlaid upon the true creation? And that the whole of the population of Earth are artificial beings and robots? But this is exactly what the Amikakh and Dr. Chippalone's material states is case of fact! Somehow people actually buy this clap-trap. Though I don't totally disregard the concept of a Planet X, since it would seem that the Summerian's have left records that are due serious inquiry. What is hard to swallow is the idea of it sneaking up on us. It is becoming increasingly clear that the Planet X, and doom generally thing is very much a distraction and tool to engender lots-o-fear and discordance, and it is working, yes? As this global systemic economic depression hits, waiting in the wings are executive orders and other nasty things such as fascism, slavery and intention to cause a clash of civilizations war. These are the real current provable doomsday threats. I think that those who want to really know what's going on, look to addressing these issues for a place to employ their energy in the form of ACTION. It will not be enough to build a bunker and stock food to prepare for the type of never before in history scenarios we now face. If the likes of Cheney, Wolfowitz, Ashcroft, Sharon and others, acting on behalf of financier interests have their way, it will make little difference if we are able to chat on the Internet now about which faction who belongs to, what so and so is really up to, whether Booth is a fraud, Amitakh is a psyop and loads of other stuff. these things would matter little to us, if in the future we are attempting to pass notes from the gulag! If there is a reasonable explanation for the many distractions upon us now, keeping us from realizing the true threats would be the most obvious.